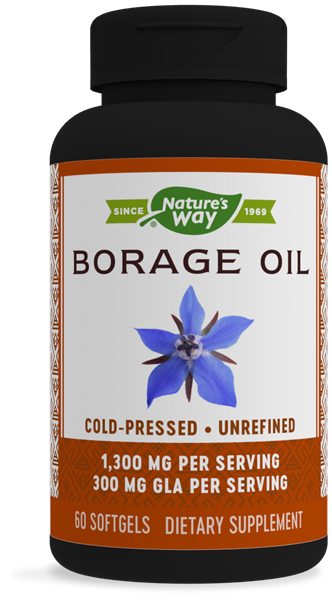 Borage Oil / 1300 mg / 60 Softgels - Nature's Way®. Nature's Way EfaGold® is the highest quality Borage oil - 24% gamma-linolenic acid (GLA) from Non-Bioengineered seeds. GLA is an important Omega-6 essential fatty acid which must be obtained in your everyday diet. Cold pressed and unrefined. Quality control from soil to oil: Our involvement begins in the fields and continues through harvesting, seed selection, oil pressing, and purity testing. Take 1 softgel one to two times daily. Cold Pressed, Unrefined. No chemical solvents.